The results of five large randomized control clinical trials on endovascular intervention in acute ischemic stroke, MR CLEAN,  EXTEND IA,  ESCAPE,  SWIFT-PRIME,  and REVASCAT  published between December 2014 and April 2015 provide the much needed evidence-based answer for acute stroke intervention following the back-to-back neutral results of three trials, Interventional Management of Stroke III (IMS-III),  SYNTHESIS Expansion,  and MR RESCUE,  published in early 2013. How are the new trials different from the earlier ones? Do they mitigate the questions raised by the neutral results of the previous studies? Do the divergent results of the clinical trials carry any message with respect to the general design characteristics of clinical trials? In a previous paper,  we have argued that the clinical trials that allow significant heterogeneity of patients or interventions result in uncertain outcomes that cannot be considered clinically meaningful. We discussed the history of the design and outcomes of stroke endovascular intervention trials to postulate this conclusion. In this paper, we review the outcome of four subsequent trials on the question to validate this point of view. An overview of the trials is given in [Table 1]. The first trial of the series of trials, MR CLEAN, was presented in the World Stroke Congress 2014 and published in December 2014. The positive result of the study prompted interim analysis of the ongoing studies on the question. Four trials were terminated early due to overwhelming efficacy in favor of the intervention. For the sake of discussion, we would discuss these series of studies as ESCPAE-EXTEND group of trials. All these trials studied proximal anterior circulation strokes and required angiographic demonstration of the occlusion before randomization. Apart from this, they used multimodal imaging to determine the extent of infarcted tissue. Stent retrievers were the principal agent of endovascular intervention used in these studies. In many ways, the ESCAPE-EXTEND group of trials is a recast of the nature of pioneering neurointervention trials in acute ischemic stroke - The PROACT and MELT. , Both these trials required angiographic demonstration of lesion, and both involved a homogenous cohort of anterior circulation stroke using a single intervention, intraarterial urokinase. PROACT II was a positive trial while MELT was prematurely stopped due to a certain extraneous consideration. A meta-analysis combing PROACT and MELT had shown benefit in favor of the intervention. The major difference between PROACT and the present trials with regard to patient selection is in the use of computed tomography (CT) or multimodal CT to show infarct core for excluding patients with moderate-to-large infarct core. This patient selection procedure, in effect, further homogenized the patient population. The post-PROACT history of neurointervention trials in acute ischemic stroke was checkered by introduction of "standard of care" by means of a surrogate marker of clinical efficacy, the recanalization rate. The United States regulatory policy for approving devices developed using surrogate markers in single-arm observational studies was instrumental in the establishment of the "standard of care" neuroendovascular interventional practice on "claims of efficacy" based on surrogate marker. This made it almost impossible to conduct a randomized control trial on the question. Because of this difficulty, the investigators of trials such as SYNTHESIS Expansion developed what is known as a "pragmatic design," allowing the site interventionists to use the device of their discretion in situations where the interventionist felt that there was "uncertainty" regarding the benefit of endovascular versus medical management (i.e., the presence of clinical equipoise on the relative benefit of intervention versus medical therapy). In addition, SYNTHESIS Expansion and IMS-III investigators developed the trials apparently presuming that all endovascular intervention devices were similar in their efficacy. But as these studies progressed, it became apparent, from many sources of evidence that these devices are indeed different in their clinical efficacy. It was fortuitous that during the same period, two non-inferiority trials - SWIFT  and TREVO2  - comparing newer devices Solitaire and Trevo with Merci were published. Both these trials used the surrogate marker of "recanalization" as the primary outcome parameter. The design and nature of these trials indicated that these were developed to piggyback on the "recanalization advantage" of the United States Food and Drug Administration (US FDA) approved "standard of care" device MERCI. They, however, found that these devices are not only noninferior to MERCI but are actually far superior. The superiority of the newer devices was evident in the primary efficacy parameter recanalization rate as well as the secondary efficacy parameter modified Rankin Scale. Thus, as the neutral results of IMS-III, SYNTHESIS Expansion, and MR RESCUE were announced, the reasons for their disappointing outcomes were also apparent. The new generation trials are, with two exceptions, "non-pragmatic" recast of the IMS-III and SYNTHESIS Expansion. Rather than allowing the site the interventionist the liberty of choice, all the studies tightly controlled enrollment, both at the level of the nature of the disease as well as at the level of intervention. Partial exceptions to this, at the level of the protocol, are the MR CLEAN and ESCAPE trials. The MR CLEAN was a pragmatic trial of the nature of SYNTHESIS Expansion that allowed the interventionist a choice of interventions from intraarterial urokinase to mechanical devices such as MERCI and Solitaire. The ESCAPE trial also allowed the interventionalist to use locally available devices to achieve reperfusion although the use of retrievable stent was recommended. Notwithstanding the liberty in the protocol, at the conclusion of the study, majority of the devices used in both the studies were the stent retriever (97% in MR CLEAN and 86.1% in ESCAPE). This reflected the change in the practice among the neurointerventionist community as these trials were in progress. ESCAPE and REVASCAT had allowed a longer window for the intervention (12 h and 8 h, respectively, after the onset of the stroke). However, in the final results most of the patients were randomized within 6 h. The median and interquartile range (IQR) for randomization in ESCAPE trial were 169 min and 117-285 min, respectively, while for REVASCAT trial the median and IQR were 223 min and 170-312 min, respectively. The most likely scenario for this phenomenon is that although a wider intervention window was allowed, the imaging criteria of favorable ASPECT score had excluded many patients who came later in the course of time, thereby limiting the effective intervention period to around 6 h, similar to the therapeutic window of old generation intervention trials PROACT II and SYNTHESIS Pilot. , Further, all these trials showed a median National Institutes of Health Stroke Scale (NIHSS) score of around 17 (EXTENDIA 17, IQR-13-20; ESCAPE 16, IQR-12-20; MR CLEAN 17, IQR-14-21; REVASCAT 17, IQR-14-20), similar to the NIHSS scores of PROACT II and SYNTHESIS Pilot (17; 17, IQR-11-19). It is important to recall that the mean NIHSS score of SYNTHESIS Expansion was 13. In the case of IMS-III, the subgroups of patients with low NIHSS score showed narrow confidence interval (0.81-1.68 in patients who presented within 120 min) while those with high NIHSS score showed wider confidence interval (0.6-5.21 for those presenting within 120 min) suggesting that the group with low NIHSS score tallied with the final estimate of the study (of no difference between the intervention and the medical management) than the group with higher NIHSS score. Thus,both these studies recruited patients who were inappropriate for endovascular intervention, much in divergence to the hints from the results of trials like PROACT-II and SYNTHESIS Pilot. Effectively, in contrast to IMS-III, SYNTHESIS Expansion and MR RESCUE, all the new intervention trials had homogenous population and intervention, similar to the pioneering stroke intervention trials that have yielded positive or "near-positive" outcomes. What Make the New Trials Attractive? All the trials discussed above are characterized by phenomenal effect size [Table 1]. While this has been the case across the groups, the more focused the study population, the better the effect size. Thus, the EXTEND-IA that used CT perfusion imaging to select patients from those who are eligible by vessel occlusion criteria showed an absolute increase of early neurologic improvement by 43% and an absolute increase of 31% in functional independence at 90 days. Indeed, the study that was least selective of the lot, MR CLEAN, showed the least effect size of 13.7%. The positive outcomes in the new generation trials were against a control group that had been thromolyzed with intravenous tissue plasminogen activator in ESCAPE, EXEND Ia, REVASCT, and SWIFT PRIME while in MR CLEAN, about 85% of patients in the control group had undergone intravenous thrombolysis. While this has been interpreted as the unequivocal efficacy of the stent retriever in the particular settings of the trial (proximal anterior circulation occlusion), it is important to note that similar efficacy was achieved in the SYNTHESIS pilot trial where intraarterial t-PA was compared against intravenous t-PA. In the SYNTHESIS Pilot trial a post-hoc calculation for a redefined outcome parameter of modified Rankin scale of 2 or less, has shown an absolute increase in favorable outcome of 25%. However, as SYNTHESIS pilot was prematurely terminated and does not stand against the quality of evidence given by the newer trials, the standard of care recommendation for the group of patients defined by these trials is bound to shift in favor of stent retrievers. What Do These Trials Resolve? These trials conclusively provide high quality evidence for intraarterial intervention using stent retrievers in proximal anterior circulation ischemic stroke with mild infarct core at presentations demonstrated by CT/magnetic resonance imaging (MRI) perfusion study or ASPECT score. According to the prescreening log provided by SWIFT-PRIME protocol, the patients eligible for the intervention form about 10% of the population of acute ischemic stroke. This is an important population of patients as this is the group of patients who would do poorly with intravenous t-PA. Thus, combined with intravenous t-PA "appropriate" patients, the number of patients who can be brought under emergency revascularization would improve substantially. Given the outcome of studies such as Tyrol stroke pathway  and PHANTOM-S  that showed that proper care pathway and prehospital thrombolysis protocol can increase the number of patients who can be thrombolyzed to as much as 30%, the results of ESCAPE-EXTEND group of trials would enormously widen the scope of stroke thrombolysis as a discipline requiring focused attention. The centers that conducted the ESCAPE-EXTEND group of trials are those with state-of-the-art technology and workflow strategies. The median door to groin puncture time in EXTEND Ia is 113 (IQR: 83-159) while that of SWIFT PRIME is 90 (IQR: 69-120). The median stroke onset to revascularization time for ESCAPE and REVASCAT, the studies with more liberal therapeutic window, are 241 (176-359) and 355 (269-430), respectively. Most of the studies considered meeting the time targets as the prerequisite of site enrollment. For instance, MR CLEAN and SWIFT-PRIME stipulated that the patients should be enrolled only if the intervention can be carried out within a period of 6 h of onset of stroke. The study protocol of the ESCAPE trial that had allowed a wider intervention window of 10 h from the onset of stroke insisted that the patient needed to be excluded from the study if patient or workflow-related factors portend hindrances for meeting time targets. It is apparent that these workflow dynamics contributed significantly to the success of these trials. It is doubtful whether without these strategies, the results of these can be replicated in practice. Thus, the generalizability of the results of these trials depends on how well the workflow characteristics of these studies are emulated in emergency stroke care practice. This would appear as a herculean task for many countries where care pathways are not established even for intravenous thrombolysis. However, the effect size demonstrated by these studies is so enticing that it would be unreasonable and unethical to neglect the strength of the evidence. A cost-effectiveness analysis comparing the upstream cost of emergency stroke care service with the downstream societal cost of disabling stroke would enable health care administrators to make the critical investment decisions. We believe that this would allow us to address the issue of emergency stroke care service in a fundamentally different light. What Does the Stroke Intervention Trials Tell About the Nature of Clinical Trials? To conclude, the tortuous history of acute stroke intervention trials is the domino effect of misplaced regulatory policies adapted by US FDA in discriminating the evidence-based requirements for devices versus drugs. Epistemologically, it is a case study of how clinical trials fail to show anticipated results when the issue of heterogeneity of the population and the intervention are inadequately addressed in the design of the study. The mechanistically explicable nature of stroke pathophysiology helps us to decipher this phenomenon in reasonable detail. The outcome of clinical trials on diseases where similar biological heterogeneity is anticipated should be considered uncertain unless it can be shown that the population and interventions are reasonably homogenous. Berkhemer OA, Fransen PS, Beumer D, van den Berg LA, Lingsma HF, Yoo AJ, et al. MR CLEAN Investigators. A randomized trial of intraarterial treatment for acute ischemic stroke. N Engl J Med 2015;372:11-20. Campbell BC, Mitchell PJ, Kleinig TJ, Dewey HM, Churilov L, Yassi N, et al. EXTEND-IA Investigators. Endovascular therapy for ischemic stroke with perfusion-imaging selection. N Engl J Med 2015;372:1009-18. Goyal M, Demchuk AM, Menon BK, EesaM, Rempel JL, Thornton J, et al. ESCAPE Trial Investigators. 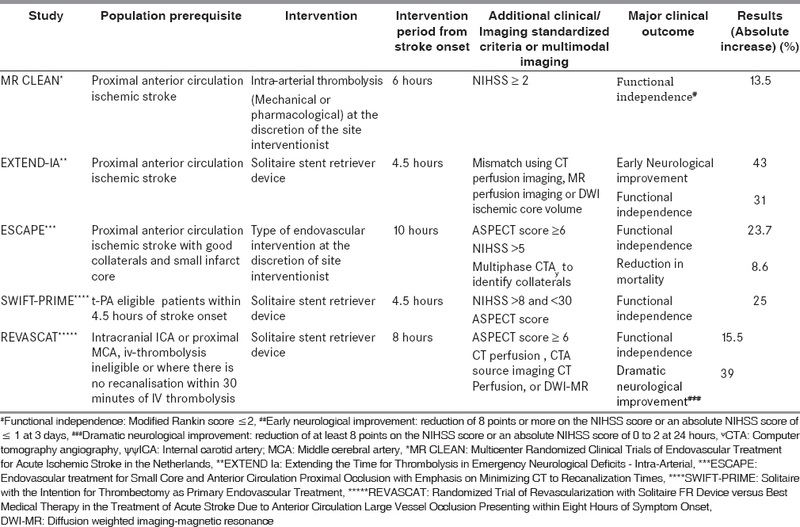 Randomized assessment of rapid endovascular treatment of ischemic stroke. N Engl J Med 2015;372:1019-30. Saver JL, Goyal M, Bonafe A, Diener HC, Levy EI, Pereira VM, et al. SWIFT PRIME Investigators. Stent-retriever thrombectomy after intravenous t-PA vs. t-PA alone in stroke. N Engl J Med 2015;372:2285-95. Jovin TG, Chamorro A, Cobo E, de Miquel MA, Molina CA, Rovira A, et al. REVASCAT Trial Investigators. Thrombectomy within 8 hours after symptom onset in ischemic stroke. N Engl J Med 2015;372:2296-306. Broderick JP, Palesch YY, Demchuk AM, Yeatts SD, Khatri P, Hill MD, et al. Interventional Management of Stroke (IMS) III Investigators. Endovascular therapy after intravenous t-PA versus t-PA alone for stroke. N Engl J Med 2013;368:893-903. Ciccone A, Valvassori L, Nichelatti M, Sgoifo A, Ponzio M, Sterzi R, et al. SYNTHESIS Expansion Investigators. Endovascular treatment for acute ischemic stroke. N Engl J Med 2013;368: 904-13. Kidwell CS, Jahan R, Gornbein J, Alger JR, Nenov V, Ajani Z, et al. MR RESCUE Investigators. A trial of imaging selection and endovascular treatment for ischemic stroke. N Engl J Med 2013;368:914-23. Srijithesh PR, Husain S. Influence of trial design, heterogeneity and regulatory environment on the results of clinical trials: An appraisal in the context of recent trials on acute stroke intervention. Ann Indian Acad Neurol 2014;17:365-70. Furlan A, Higashida R, Wechsler L, Gent M, Rowley H, Kase C, et al. Intra-arterial prourokinase for acute ischemic stroke. The PROACT II Study: A randomized controlled trial. Prolyse in Acute Cerebral Thromboembolism. JAMA 1999;282:2003-11. Ogawa A, Mori E, Minematsu K, Taki W, Takahashi A, Nemoto S, et al. MELT Study Group. Randomized trial of intraarterial infusion of urokinase within 6 hours of middle cerebral artery stroke: The middle cerebral artery embolism local fibrinolytic intervention trial (MELT) Japan. Stroke 2007;38:2633-9. Saver JL. Intra-arterial fibrinolysis for acute ischemic stroke: The message of melt. Stroke 2007;38:2627-8. Ciccone A, Valvassori L, Gasparotti R, Scomazzoni F, Ballabio E, Sterzi R. Debunking 7 myths that hamper the realization of randomized controlled trials on intra-arterial thrombolysis for acute ischemic stroke. Stroke 2007;38:2191-5. Saver JL, Jahan R, Levy EI, Jovin TG, Baxter B, Nogueira RG, et al. SWIFT Trialists. Solitaire flow restoration device versus the Merci Retriever in patients with acute ischaemic stroke (SWIFT): A randomised, parallel-group, non-inferiority trial. Lancet 2012;380:1241-9. Nogueira RG, Lutsep HL, Gupta R, Jovin TG, Albers GW, Walker GA, et al. TREVO 2 Trialists. Trevo versus Merci retrievers for thrombectomy revascularisation of large vessel occlusions in acute ischaemic stroke (TREVO 2): A randomised trial. Lancet 2012;380:1231-40. Fransen PS, Beumer D, Berkhemer OA, van den Berg LA, Lingsma H, van der Lugt A, et al. MR CLEAN Investigators. MR CLEAN, a multicenter randomized clinical trial of endovascular treatment for acute ischemic stroke in the Netherlands: Study protocol for a randomized controlled trial. Trials 2014;15:343. Ciccone A, Valvassori L, Ponzio M, Ballabio E, Gasparotti R, Sessa M, et al. SYNTHESIS Investigators. Intra-arterial or intravenous thrombolysis for acute ischemic stroke? The SYNTHESIS pilot trial. J Neurointerv Surg 2010;2:74-9. Willeit J, Geley T, Schöch J, Rinner H, Tür A, Kreuzer H, et al. Thrombolysis and clinical outcome in patients with stroke after implementation of the Tyrol Stroke Pathway: A retrospective observational study. Lancet Neurol 2015;14:48-56. Ebinger M, Kunz A, Wendt M, Rozanski M, Winter B, Waldschmidt C, et al. Effects of golden hour thrombolysis: A prehospital acute neurological treatment and optimization of medical care in stroke (PHANTOM-S) substudy. JAMA Neurol 2015;72:25-30.